Clayton Kershaw wants to win a World Series. Of course he does. Kershaw also has an opt-out after the 2018 season, and after the Zack Greinke debacle, people are understandably worried. Hell, I’ve been tweeting out my own nervousness over that myself. As such, it’s only understandable that Dylan Hernandez of the Los Angeles Times wrote today about how the Dodgers might be wasting Kershaw’s generational talent and risk losing him in the future. There’s some logic to the idea, except you wonder if the team’s decision makers are looking too far ahead to recognize the opportunity right in front of them — specifically, that Clayton Kershaw is theirs for at least three more seasons. At the end of the 2018 season, Kershaw will have the option of doing what Zack Greinke did over the winter and void the remainder of his contract. Greinke didn’t return. Kershaw might not, either. This isn’t dissimilar from my complaints about how the front office has built the rotation, at least in that signing Greinke would’ve likely paved over a lot of problems as they rebuild, and if any team could eat a pitcher’s declining mid-30s period it’s the Dodgers. Furthermore, I also agree with the growing sense of dread that Kershaw could be deemed expendable in 2019 or that he’ll willingly want out. So while there’s a lot in the article that I didn’t disagree with, there were arguments I took issue with, like the inference that only aces win in the playoffs and not just solid pitchers who win during the regular season. A surplus of serviceable arms is certainly useful over the course of a 162-game season. Mike Bolsinger and Zach Lee types can pick up wins that help the team reach the playoffs. But what about when they get there? There are countless counters to this, the most obvious being, “Well if they did pitch well during the regular season, why couldn’t they win games in the playoffs?” The other being: Joe Blanton, World Series champion rotation member and ball-thrower man responsible for a Game 4 gem in 2008. But that’s just a minor quibble, and it’s the stuff relating to Kershaw that made me write this. That’s because the most frequently parroted narrative is the notion that the Dodgers have and are still letting Kershaw down with the teams they’ve put out on the field. Recent history suggests the Dodgers have been short a frontline starter. They were competitive in the four games Kershaw and Greinke started last October in their National League division series against the New York Mets. They were blown out in the one pitched by Brett Anderson. 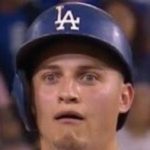 The Dodgers lost the series, three games to two. But rather than add an ace, the Dodgers subtracted one, allowing Greinke to sign with the Arizona Diamondbacks and failing to replace him with someone of his caliber. Kershaw was drafted by the Dodgers and should retire with them. If he feels the organization wasted his best seasons and decides to go elsewhere in three years, the team will have a public-relations nightmare that will evoke memories of the infamous Mike Piazza trade. Why? Well let’s take a look at how the Dodgers have supposedly screwed Kershaw so bad in his quest to play for a winner. Brett Anderson had a disaster start against the Mets in 2015, and the other four games were competitive. No dispute there. But the Dodgers had to lose two other games in that series, and two Cy Young Award candidates gave up three runs in six innings plus in each of those two losses while they were outdueled by a bunch of up-and-coming aces. Going back to 2014, Kershaw surrendered eight runs in one game and three more in the series clincher against the Cardinals. While Greinke was great in his one game, Hyun Jin Ryu was also great as the No. 3 starter, providing six innings of one-run ball while probably pitching with a torn labrum. Finally, in 2013, against the Cardinals in the first three games of the series, all of Greinke, Kershaw, AND Ryu pitched extremely well. Ricky Nolasco allowed three runs in one game, but Greinke bounced back with a gem before Kershaw gave up seven runs in the series clincher. So yeah, this is a ridiculous enough narrative that it made me defend the job Ned Colletti did. Obviously Kershaw hasn’t blamed the front office for the Dodgers failures, but other people speaking on his behalf have, and it’s a bit amusing considering the reality of the situation when laid out. In basically every year the Dodgers have been eliminated, it’s not the No. 3 starter who’s been losing pitching duels in key games, and unless you want four aces (which obviously couldn’t lose, like the 2011 Phillies), it’s hard to blame the singular starts of Anderson or Nolasco for collapsing the team in the playoffs. What is clear, then, is that it’s the team’s “aces” who have not come through with the “ace” performances when the team has needed it the most. And Kershaw’s well-documented struggles in the postseason thus far are a significant part of that. Inevitably, some mouthbreathers will say this post is being traitorous scum towards Kershaw or whatever, but bashing Kershaw is definitely not the point of this. Like all fans, I love Kershaw, think he’ll go down as the best pitcher to wear a Dodgers uniform, and the stuff about him being a postseason choker will quite likely prove to be horseshit over time. And besides the fact that it’s a team sport and that he didn’t lose the games by himself, there’s definitely plenty of blame to go around from the front office to the manager to the other players themselves. However, what I am arguing here is that this garbage about painting Kershaw as an innocent victim of Colletti and Farhan Zaidi‘s teams that managed to win 90+ games is utterly ridiculous. And if anybody’s the victim here, it’s been the other way around thus far. So please fans, just stop parroting that garbage narrative about the Dodgers not having enough talent to have won the World Series in the recent past. But don’t worry, even without that crutch of an argument, there’s still plenty of other stuff to be miserable about.